1Department of Pharmacology, KVG Medical College and Hospital, Sullia, Dakshina Kannada, Karnataka, 574327. INDIA. 2Department of Pharmacology, KS Hegde Medical Academy, NITTE University, Deralakatte, Mangalore, Karnataka, 575018. INDIA. 3Department of Biochemistry, KVG Medical College & Hospital, Sullia, Dakshina Kannada, Karnataka, 574327. INDIA. 4Research Officer, Department of Pharmacognosy, Siddha Central Research Institute, Central Council for Research in Siddha, Arumbakkam, Chennai, 600106. INDIA. 5SDM Centre for Research in Ayurveda and Allied Sciences, Laxminarayana Nagar, Kuthpady, Udupi, Karnataka, 574118. INDIA. Actinoscirpus grossus (L.f.) Goetgh. & D.A.Simpson (Cyperaceae), is a Perennial with long stolons and rhizomes ending in small tubers. It is popularly known as Kasheruk in Sanskrit. The plant is traditionally used as anti-diarrheal, anti-emetic, and tonic to the liver. In order to do the detail standardization of plant macro-microscopical observation, phytochemical analysis and HPTLC Finger printing of tuber was performed according to pharmacopoeia procedure. Microscopic analysis has showed thick-walled polygonal epidermal cells of young root stalk in surface view, elongated phloem parenchyma filled with starch grains, spiral to annular vessel fragments and simple starch grains scattered all over the powder. Phytochemical analysis showed presence of carbohydrate, coumarins, flavanoids, steroid, tannin, and terpenoid. Ethanol extract of plant were fingerprinted in toluene: ethyl acetate (7:3). The developed plates were visualized in UV 254, 366, and then derivatised with vanillin sulphuric acid and scanned under UV 254 and 366 nm. These specific identities will be useful in identification and authentication of the raw drug. 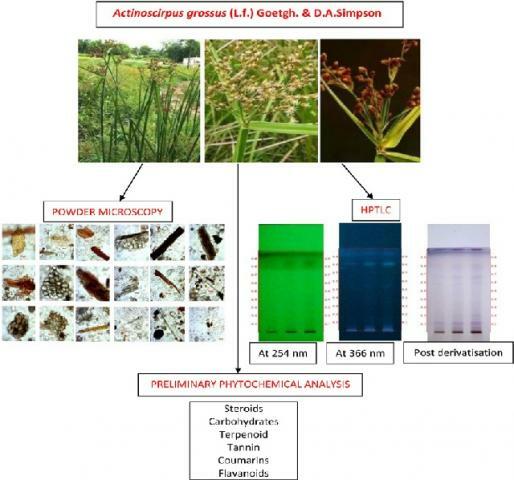 Ganapathi SC, Holla R, Shankara S, Narayana SK, Mundugaru R. Microscopical Evaluation, Phytochemical Analysis and HPTLC Fingerprinting of Tuber of Actinoscirpus grossus (L.f.) Goetgh. & D.A.Simpson. Pharmacognosy Journal. 2017;9(5):657-662.